To create your spreadsheet, we recommend using Google Sheets or Numbers (if you're on a Mac). We do not recommend Excel as it may create unreadable characters in .csv files. 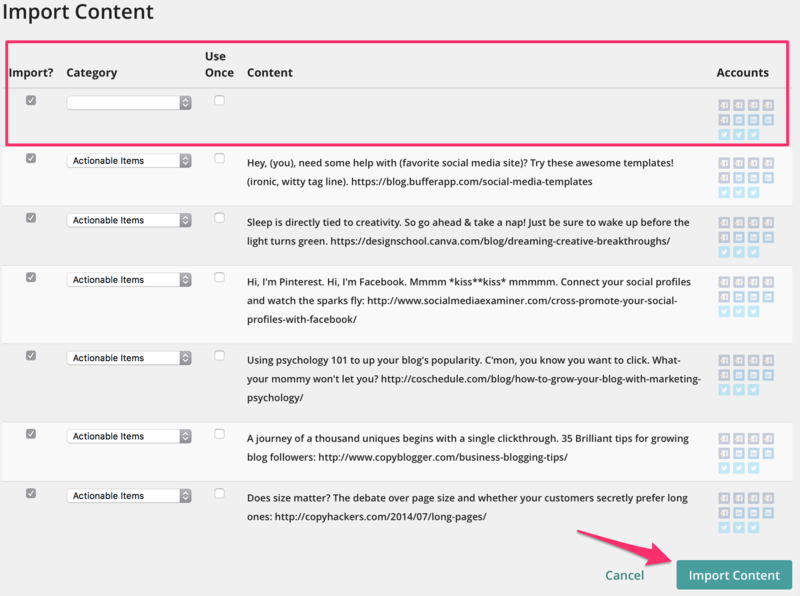 Place all of your content (including any links) in Column A.
Optionally, you can place the category you'd like each of your posts to be uploaded to in Column B. This is case specific, i.e. use My Blog Posts instead of my blog posts. 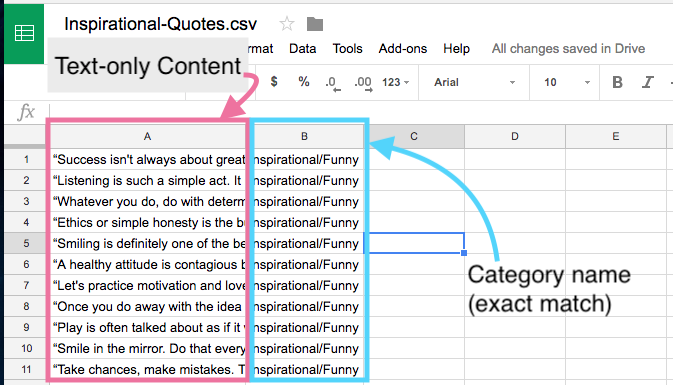 And don't put a category on your spreadsheet unless you have already created that category in Edgar on the Categories page. There should be no content in any columns except A and B. At this time, bulk import is text only. Please note: Edgar's bulk import works with text only. Bulk imports do not work for images, videos or text with emojis. ** Note on Link Shortening with Bulk Imports: If you have chosen bit.ly as your URL shortener, limit your CSV file to 100 rows or less to avoid bit.ly's rate limit. Files larger than 100 rows may not have links shortened correctly for bit.ly. Need more help? Scroll down to see specific directions for creating a .csv file in various spreadsheet programs. The steps are slightly different depending which spreadsheet software you use. See below for specific details for Google Sheets, Numbers, and Notepad. *Note: We do not recommend using Excel as it may create unreadable characters in CSV files. *If you use Excel for Mac, we highly recommend that you open your spreadsheet in either Numbers or Google Sheets to convert and export the final csv file to UTF-8 encoding. Excel for Mac does not natively support the import or export of UTF-8 encoded files. To start a bulk import, go to Import and click Import File. Select your .csv file from your computer, and click Import. 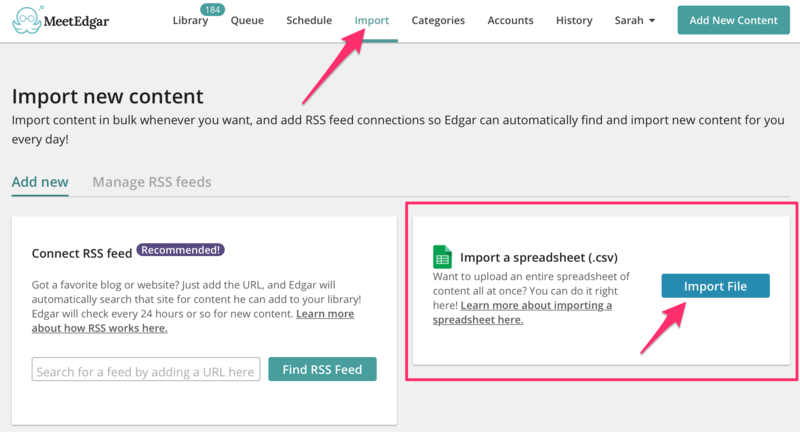 Edgar will grab all your posts from your .csv file and display them in a list for you. Use the social media icons on the right to associate your content with your social media accounts. Use the drop down menus to change the categories of your posts, if desired. And use the Use Once check boxes if you'd like this imported content to be used one time only. Click Import Content at the bottom to add your content to your Library.